The pleasant town of La Ciotat seen from la Route des Cretes in Bouches du Rhone, Provence in France, Europe. 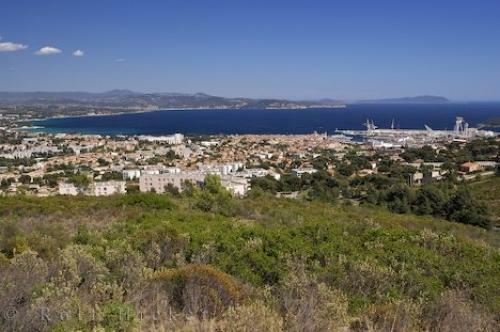 Photo of the town of La Ciotat in Bouches du Rhone in Provence, France in Europe. ... 1895 Auguste and Louis Lumiere premiered the world's first motion picture -'L'Arrivee d'un Train en Garde de La Ciotat' - basically, a steam train moving forward in a series of two-minute reels. Nowadays, La Ciotat in Bouches Du Rhone in Provence, France presents an annual film festival every June.Town of La Ciotat seen from the Route des Cretes, Les Calanques, Bouches du Rhone, Provence, France, Europe. I photographed this photo with the digital SLR camera model Canon EOS-1Ds Mark II, aperture of f/8.0, exposure time of 1/200 sec. on ISO 100, as always I used a original Canon Lens, the focus lenght for this picture was 35mm.